For a young couple “from off” who met at the College of Charleston, Melissa Barton of A Charleston Bride created a wedding reception that brought together the arts, cuisine, and history of the Lowcountry for their visiting families and friends. “This couple loves sweetgrass baskets, so we chose to make that an integral design element,” says Barton. 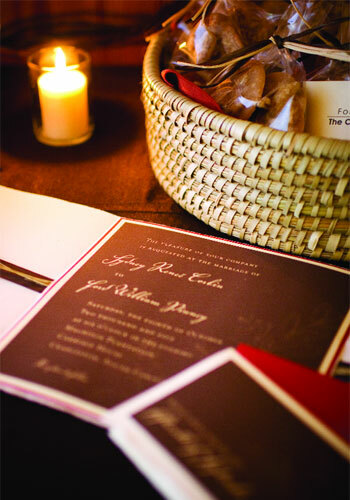 Beginning with warm earth, honey, and deep red tones, Studio R Designs wove blades of sweetgrass into the ribbons of the handmade chocolate-brown invitations. Choosing a color palette is integral to any celebration, says Barton. “Many brides want one trendy color for the save-the-date cards and then jump to another for their invitations,” she continues. Rather than let couples go off on a tangent, she encourages them to choose their color palette and stick with it. She suggests visiting any home improvement store, where a rainbow of paint swatches can be combined into complementary tones, making it so much easier for a bride to come up with her own color palette. “From there, you can select flowers or fruits that contribute to your theme,” she says. This bride and groom wanted to focus on the inimitable Lowcountry surroundings, so Barton found inventive ways to incorporate the romantic history of Charleston into every element of the décor. The elegantly rustic Carriage House at Magnolia Plantation has wood walls and ceilings and views of centuries-old live oaks that make it a perfect setting for fall weddings. Barton reveals that there was some strategy behind selecting the plantation. “Choosing a location can be a huge key to following your wedding budget. Some locations insist that you use their staff and caterer, and often the extra price comes as a surprise; you will pay more for their exclusive use.” On the other hand, certain sites like Magnolia include the use of tables, chairs, and a romantic outdoor area. Combining beauty and economy, a savvy bride might decide to have the ceremony and the reception in the same place. Barton chose to keep table centerpieces to a minimum because of the size of the natural wood and red porcelain platters that would be used during the family-style dinner. She wrapped sweetgrass around the inside of glass cylinders and then fitted candles inside, which set the dark wood and burnt-orange table runners aglow. Spheres of scarlet roses hung suspended over the tables by transparent monofilament. 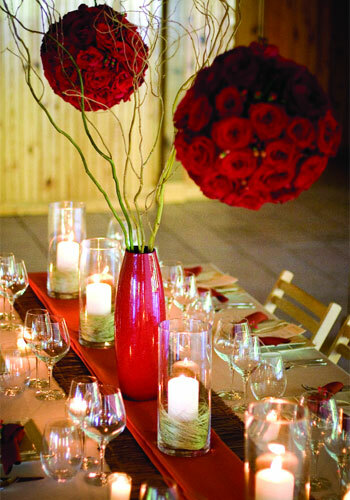 Curly willow formed stately columns, and votives offered additional intimate lighting. 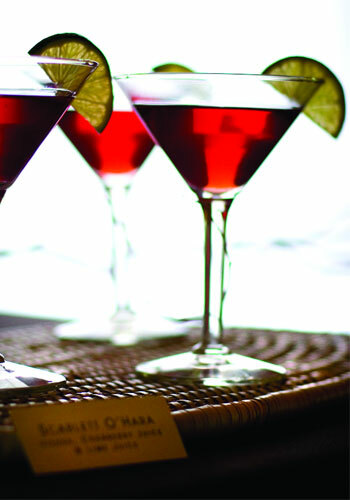 The signature drink for the cocktail hour matched both the color and the Southern theme: Scarlett O’Haras are a decadent, brilliant-red mixture of Southern Comfort, cranberry, and lime served in martini glasses with a lime wedge. 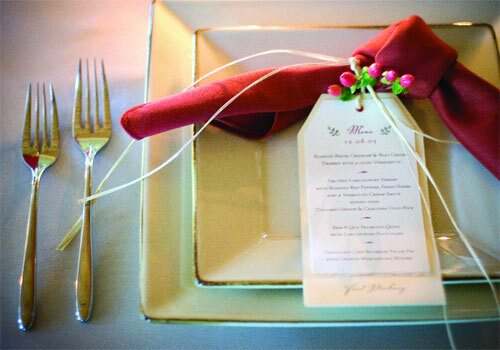 “Mint juleps are also a good Southern drink, but are predominately for spring weddings.” Announcing the family-style dinner served on platters and passed around the table, hand-crafted menu cards were tied to the napkins with sprigs of coffee berries and sweetgrass and placed on ivory china with chocolate-brown edging. 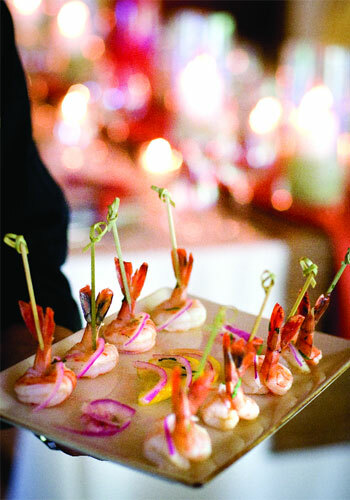 The caterer served up a sumptuous feast of Lowcountry shrimp and grits, barbecued palmetto quail, cornbread, and butternut squash soup. 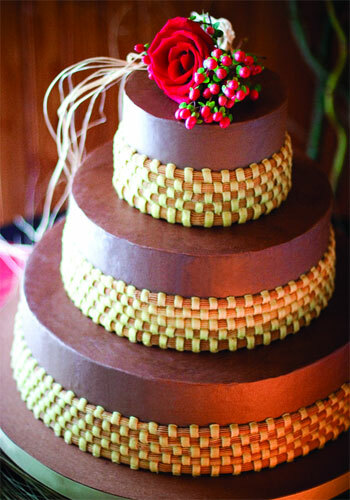 The pinnacle of the sweetgrass theme was the cake by Ashley Bakery: three tiers of chocolate wrapped in woven sweetgrass icing, almost indistinguishable from the real thing. Displayed on chocolate-brown linen with burnt-orange overlay, the cake was by topped with coffee berries and a single rose. 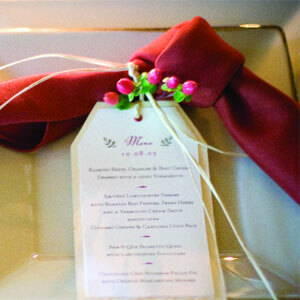 Guests were treated to individual bags of Charleston pralines, displayed in a sweetgrass bowl. 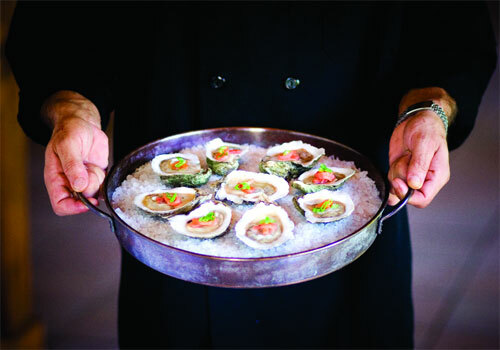 “People always adore food gifts, and Market Street Sweets can custom-design your favors very economically,” says Barton. Because the couple wanted to honor their family members who had been married for 50 or more years, the designer created a wall of black and white family photos from the 1920s through the ’50s. 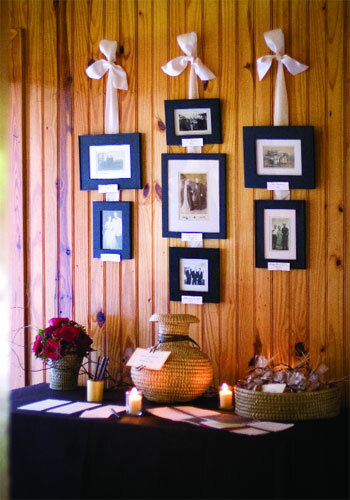 Beneath that she placed a table with cards and a sweetgrass basket where guests could write and deposit kind wishes and sage advice for the bride and groom.